AFRICANGLOBE – The University of Nairobi’s Science and Technology Park is banking on 3-D prototyping to spark a manufacturing revolution in the country. This is the 3D MakerBot printer in action. The machine is a scanner that prints three-dimensional objects of almost any shape from electronic data — using plastic as its raw material. This drastically reduces costs. Twenty-one year old Alois Mbutura is a first-year electrical engineering student at the University of Nairobi. In March, he came up with the idea of a ‘vein finder’ — a device that will help doctors administer intravenous needles to tiny infants. Today he is perfecting his design, which currently is in the prototype phase. This 3D printer can produce 100 such devices in a day. “The vein finder was actually a solution that the School of Health and School of Engineering partnered to reduce the inability of health care people to find veins in babies and also for it to be economical and suited to Kenya,” said Mbutura. Affordable production is the hallmark of this Fabrication Laboratory. 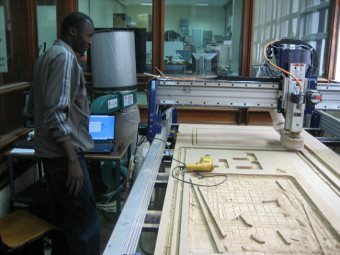 “Fab Lab” as it’s called, is a small-scale workshop offering digital fabrication at the University of Nairobi. It is part of the international Fab Lab network which started at the Massachusetts Institute of Technology. There are some 400 FabLabs worldwide and two in Kenya. Gachigi believes they will promote the creation of an atmosphere and culture of innovation. “The maker movement will generate a new kind of producer so to speak and a lot of young people are extremely interested. Young people have a knack for technology,” said Gachigi. And this maker movement is gradually beginning to take shape. Two years ago, Peter Mburi won the People’s Choice award at the NASA Space Applications Challenge for his ‘Bit Harvester’ invention, made possible by 3D technology. “The bit harvester is an electronic device designed to monitor remotely — using SMS — wind turbines and solar installations. So you can see if they are operating okay or not operating okay and you can take the necessary measures to see how to correct the problem,” said Mburi. In a few months, a third Kenyan Fab Lab is scheduled to open on the outskirts of Nairobi. It is expected to focus on medical and energy-based equipment, taking this manufacturing revolution to another level.